What are you/your kids going to be for Halloween/ハロウィン this year? My daughter is going to be a candy corn witch and my son is going to be a doggie. We are going to celebrate with some Halloween parties, a Trunk-or-Treat, a Chili Cook-Off, and of course, lots of candy! Check out my Halloween Post from last year for some other ways to celebrate Halloween Japanese-style (like Halloween origami). 1. Learn all about ghosts and monsters in Japan at Bake Bake. 2. Halloween coloring pages at Nurieyasan. 3. Jack-o-Lantern maze at Nifty Kids. How do you celebrate Halloween where you live? Have you ever celebrated this holiday in Japan? Did you make decorations for Tanabata? If not, make sure to check out my Tanabata Post for lots of crafts and activities. Tanabata coloring page from nurie.rdy.jp. Printable Tanabata decor from Canon Creative Park. More tanabata printables by KF Studio (scroll to the middle). And if you want to see some gorgeous photos of Tanabata, visit the blogs Hello Sandwich and Omiyage Blogs. Both great blogs! My daughter and I used origami to make tanabata decorations yesterday. Now I’m off to make some mochi to celebrate! This is me about 7 years ago, in Aomori. 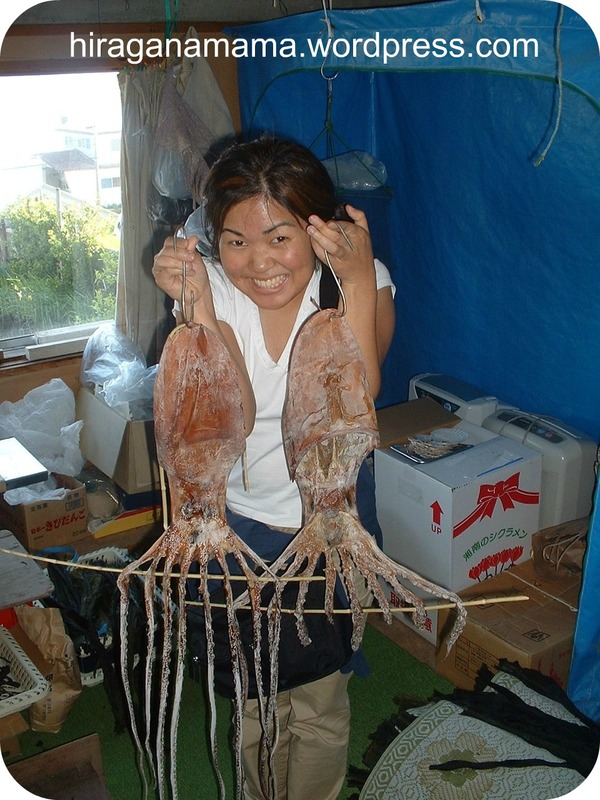 My uncle caught and dried these octopuses (octopi?). Did you know that “tako（たこ）” in Japanese means both “octopus” AND “kite”? Octopus coloring pages HERE and HERE. Japanese kite coloring page HERE. HERE are instructions for a very simple kite you can make with your children. If you are REALLY ambitious and crafty, you can try making a “real” kite by following the instructions HERE (by Windlove.net). Did you see the giveaway in the previous post? Deadline is Tuesday June 21. July 7th of every year is a Japanese holiday called Tanabata（七夕）. It is a fun and pretty holiday to celebrate with your children! The gist of the story behind the festival is this: There is a couple who lives in the sky… Orihime (the Weaving Princess) and Hikoboshi (the Sky King). They are permitted to cross the Milky Way and see each other just once per year… the 7th day of the 7th month. You can read a more detailed version of the story on Wikipedia, the From Japan with Love blog, About.com, and Kids Web Japan. Here is how you can celebrate Tanabata! 1) Decorate a bamboo branch with wishes and origami decorations. – You can purchase an artificial bamboo branch from saveoncrafts or Afloral.com. You could also use a different kind of tree branch. 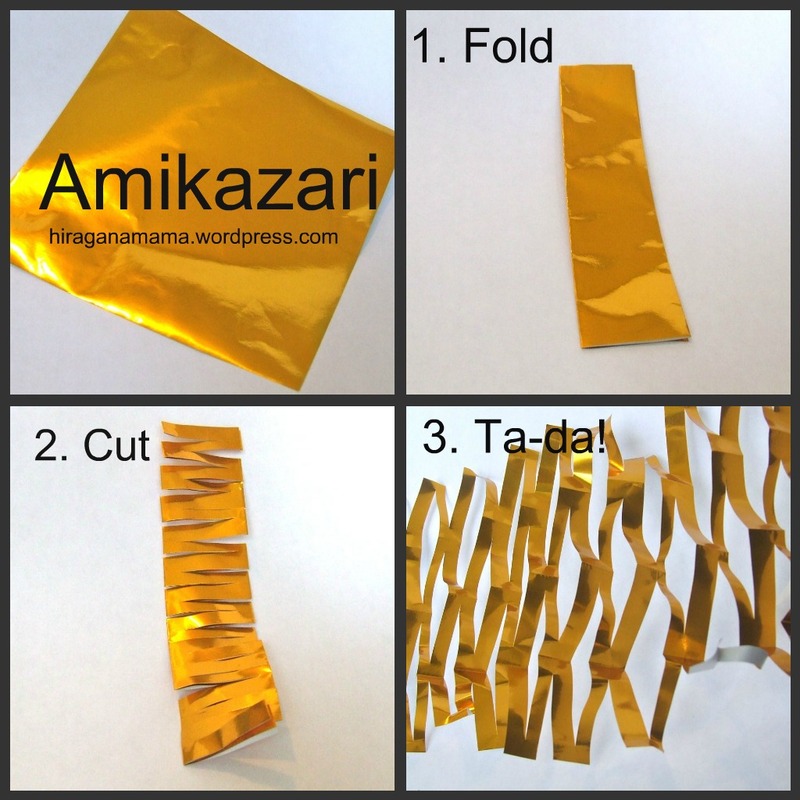 – Cut long rectangular strips of paper from origami or construction paper (called tanzaku papers), and write a wish on it. For example, “Please help me to be a straight-A student” or “I hope my mom buys me a dog.” Then hang your wish on one of the branches and pray it comes true. (You could also print one of these special papers to write your wish on from printout.jp). – You could also just print out and color some decorations. Here are some from nurieyasan and here are some from kids.nifty.com. 2. Instead of hanging your wishes on a bamboo tree, you can make tiny stars out of paper and hide your wishes inside them. 3. Learn the Tanabata Song. 4. Enjoy food like dango, manjyu, mochi, udon, somen, and red rice. 5. Read about other traditions here (you must be able to read Japanese). 6. Watch a Sazae-san episode about Tanabata HERE. I’ve never been, but have read that Sendai has the biggest and best Tanabata Festival every year. Check out these AMAZING images from the festival! I read on the website that despite the devastation that happened in March, the festival will still be held in 2011. The words that came to my mind first when I thought about words that begin with そ were そーめん/somen and ぞうさん/zousan. Did you know that elephants say “Pao~／パオ〜” in Japanese? Cute. Practice writing す HERE at 子育て・ことば育て. Have you heard of the Japanese Fable “舌切り雀” (shita-kiri-suzume/the tongue-cut sparrow)? If not, you can watch HERE. Or read the story in English HERE. I’ve already shared one of my favorite websites with you, 幼児の学習素材館 (kotoba.littlestar.jp), but I wanted to highlight a few things on their website again. There are a hundred other great learning resources on their website. Be sure to check them out! Japan has the coolest, fastest, most efficient trains in the world- no wonder little Japanese boys LOVE trains! The Shinkansen is the name for the bullet train, which can run as fast as 200 miles per hour! I hope my kids can experience the excitement of the train stations and trains in Japan someday. 1) Sanrio.com has a special website for their Shinkansen character, as well as shinkansen coloring pages. 2) Click here for another しんかんせんcoloring page. Oh, and this page has cool coloring pages of all kinds of trains (from the West Japan Railway Company)! 3) Shinkansen Kids website, here. 4) Japanese website for Thomas & Friends, here. This show is very popular in Japan. (I am a little bit embarrassed that the title of my blog includes the word “Mama” and I am belated in wishing you a Happy Mother’s Day). I hope your day was shiawase. Mother’s Day coloring pages here. It’s less than a week until こどものひ, or Children’s Day! Kodomo no hi is on Thursday May 5th (same day as Cinco de mayo). It used to be that only boys celebrated this holiday, but nowadays, both boys and girls can celebrate. The last website, All About, is especially informative (but it is all in Japanese). It has many craft ideas and recipes. Kikkoman is another website that has a lot of recipes for Children’s Day. Make sure you check out my post about koinobori, as that is a big part of the day’s celebrations. KodomoNoHi coloring pages can be found here, here, here, here, and here.